Fine weather followed the Vinduro NZ Series again for round three of the 2017/18 Series at Maramarua Forest. 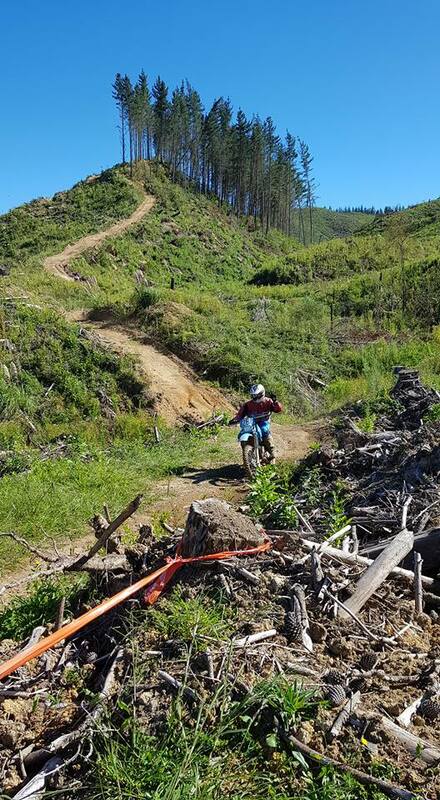 Greg Power and his small Team at Power Adventures hosted the a round again this year in the same forest where several of NZ's earliest enduro events kicked off in the mid 1970s. Then as now the ride was run from the site of the old Forest Service Headquarters, now a logging machinery workshops and HQ for Power Adventures network of trails. While the historic Maramarua rides were conducted in the depths of winter the summer date for the 2018 event made for hard dry conditions with plenty of traction, though some opportune rain two days before the ride kept the dust at bay. Again the course comprised two loops, the first of 31 and the second 26 kilometres, both made up of mainly two track bulldozed track, with some single track and fast windy gravel roads. Maramarua is planted on steep clay country, so no surprises that there were plenty of elevation changes by way of steep up and downhills to test engine power and braking, especially those relying on uncertain drum brakes. Silver grade riders tackled one lap of the two loop course while Gold grade riders repeated loop one for a total 88km for the day. Included in the course were two special tests, the last of which was repeated by Gold Grade riders. The first test was tight, much of it winding in and out of small pines. The second test comprised more open ground with some faster clay tracks including some roller-coaster hills with a memorable steep descent towards the flats at the old HQ. The consensus at the end of the day was that 2018 had been the best Maramarua Classic so far thanks to perfect weather and a heap of track work to smooth the way for old bikes and bodies. The special tests were spot on and so were the burgers and unique trophies which were well spread around bikes of all ages. Roll on 2019. Best ever photo taken of Peter Lambert! by Greg Power. Thanks to Sarah-Louise Stevens and others for photos contributed.